Darlington have today signed defender Josh Heaton from Ramsbottom. Josh, 21, started his career at Preston North End, but was released in the summer of 2016. In his ten years at Preston, he also had loan spells at Tamworth and Colne. 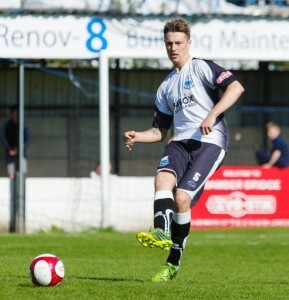 He then joined Droylsden and Stalybridge Celtic before switching to Bamber Bridge last summer. He played for Quakers in pre season, but a proposed move broke down because of injury. In October this year, he moved on to Ramsbottom in the EvoStik First Division North, making three appearances for them. Josh goes straight into the squad for the away game at Kidderminster on Saturday. We would like to wish Josh a happy and successful stay at the club. You can watch an interview with Josh below.